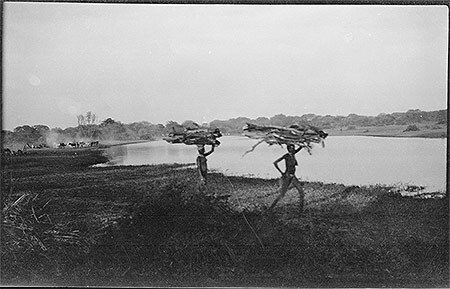 Two Nuer bringing large bundles of fuelwood to the riverbank (probably on the Sobat River). Morton, Chris. "Nuer bringing fuelwood for riverboat" Southern Sudan Project (in development). 03 Jan. 2006. Pitt Rivers Museum. <http://southernsudan.prm.ox.ac.uk/details/1998.204.5.33/>.